Veteran motorcycle drag racer Tom McCarthy has been competing in the motorcycle ranks at his local track, New England Dragway, in Epping, NH, since 1981 when time and money permit. In 2012 he looked at his buddies and all the fun they’ve had over the many years and he asked himself the question: Ok who’s number one here? Over the decades he’s seen a lot of racers come and go at his home track, but year after year, there was never a way to measure “who is the best of the best?” So he came up with a plan, he devised a race modeled loosely on a golf tournament known as “The Masters” to find out who really is the best motorcycle drag racer each year. With a little internet research, it’s easy to see the core element of The Masters is it’s elite selectivity for entrants invited to compete. Each contestant in the golf game is either a champion, a past champion, or a true tier-one competitor. No slouches allowed, period. Another core element of the competition is it’s a fierce tough course that in a short span of time will tax any veteran’s skills to the maximum. Therefore the Masters requires only the best of the best can compete and only the best in competition can win the event. It’s truly a test to see who is best. Then McCarthy asked himself, “How to equate this to motorcycle drag racing and would the track approve of such a race?” His answers are a work in progress that seem to be going in the right direction. After conferring with key racers in Top Bike, Motorcycle/Sled Eliminator, and Street Fighter, it was clear the racers were all for a fresh challenge, so Tom contacted Ron Heath the racing director at his local track. After explaining his idea in detail to Ron he received the green light to proceed to create a clash of titans at his home track. Now he needed a trophy to inspire the racers, to motivate them and pay tribute to the best of the best. This was the tough part for him, how to find a trophy befitting such a race. 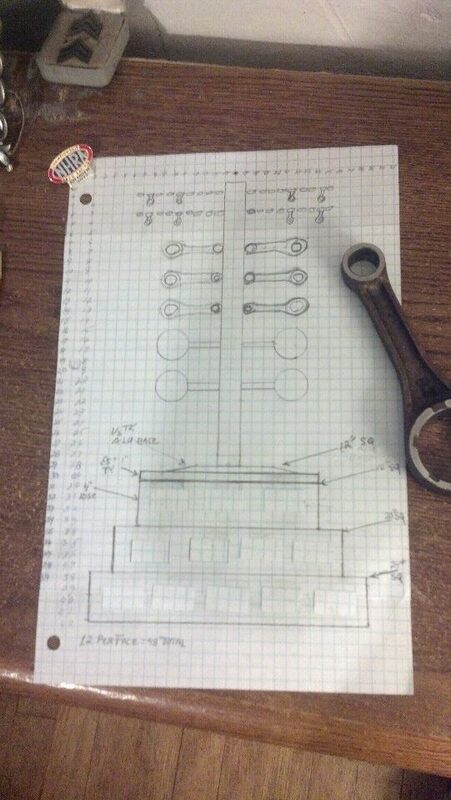 Trophy Scale Drawing: Full sized 1-1 graph paper was hand made to fix locations of the elements then scaled down to a workable size to fabricate from and a copy of the drawing was sent to Tim Root, the wood worker who began construction on the walnut base. Tom McCarthy photo. McCarthy knew he needed a trophy that would befit such a magnificent event. If the racers were to do battle under extreme circumstances, then an extreme trophy was called for. He started searching his thoughts, wondering “what could I come up with to honor winning such an event as the Motorcycle Masters?” Tougher yet, to add to the equation, he knew he couldn’t use just any motorcycle motif because if it had wheelie bars to depict a drag bike, the no-bars racers at the track would be offended. 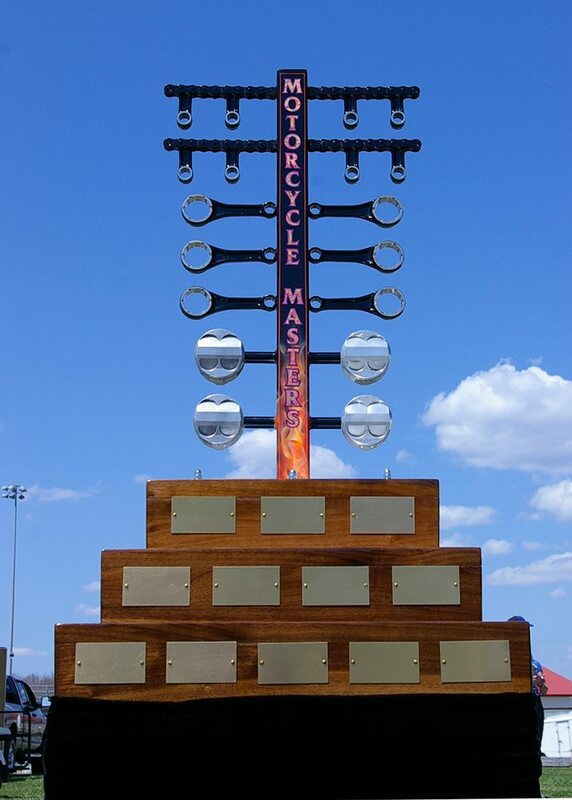 If a drag sled (snowmobile) racer was to win the trophy, having a motorcycle on top of a trophy awarded to a drag sled racer was just wrong also; what to do? He then asked himself, what do they all have in common, something they all share while racing? The answer sprang up – the starting line. Hey, the tree, top off the trophy with a starting line Christmas tree! That started a new search of the internet trophy data bases for a starting line tree. But they were all too cheesy to represent this race – a Masters Race. What about “Cold Hard Art,” he thought? Quickly, he began exchanging emails with Tom Patsis, thinking “if I could raise enough money, maybe I could afford to have Tom create a 1 of a kind Cold Hard Art creation.” Well that was the right idea, he just couldn’t afford it. So the next step was logical for any and every drag racer: “If you need it and you can’t afford it, you make it.” McCarthy then took his 20 + years of welding and fabrication skills out and put them to work. 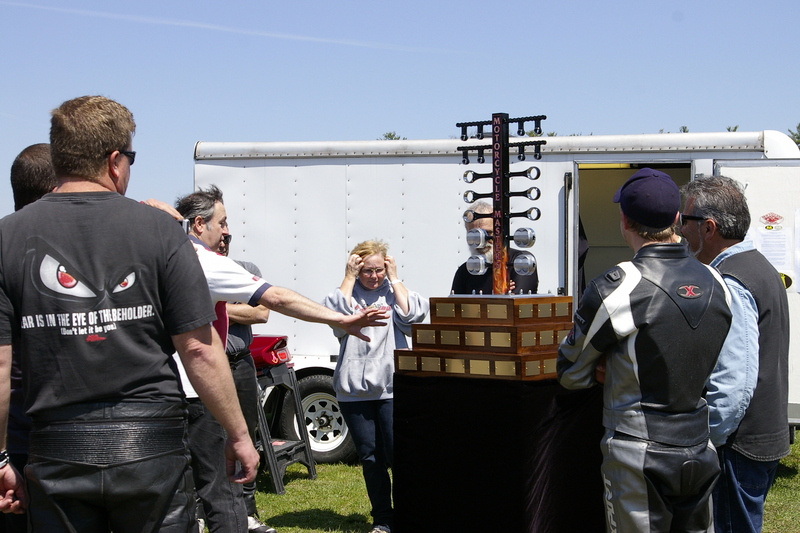 It was at this time the idea to create the trophy from broken drag bike parts came to the forefront. 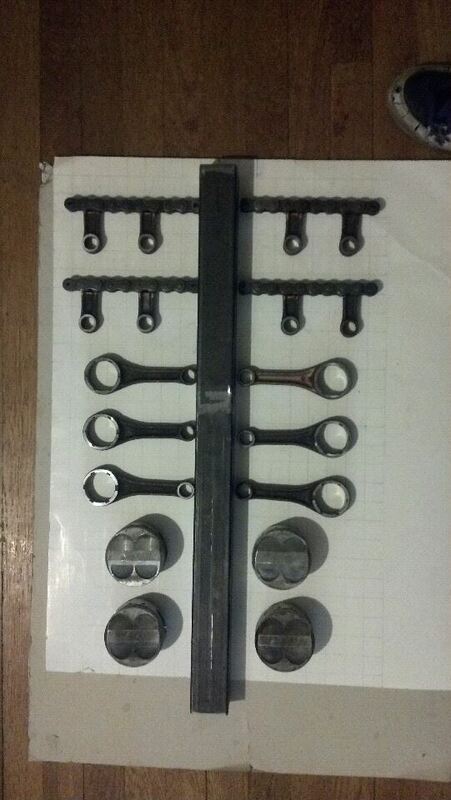 Tom put the word out on Facebook requesting worn out and broken drag bike components for a “project” he had in mind. There were no takers on that request. But after thirty years of drag bike racing he knew a lot of people with a lot of broken drag bike parts, so he went to the one person he knew, who has more broken or worn out drag bike parts laying around than any racer: Mr. Rick Stetson of Harry’s Machined Parts, in Northboro, MA. Initial Creation: With all the smaller items welded and finalized, the components were again laid out on paper full size to establish the final locations and welded into place. Tom McCarthy photo. Tom met Rick for breakfast one morning and told him about the endeavor and it’s needs, Rick responded with “Come by anytime, bring a box, take what you need.” Tom showed up with a big plastic milk-crate and loaded it up with broken pistons, bent connecting rods, and worn out motorcycle 630 drive chain. With a smile and a nod he was headed out the door. At A1 Parts, in Brookfield, Mass, where Tom works on occasions as needed as their welder/fabricator on call, he started off by cutting up a connecting rod and test welding it to a piece of scrap 2×2 steel tubing. He wanted to see if the weld would crack due to steel incompatibility. He welded one on and beat the heck out of it with a ball peen hammer: no cracks, just bending. This could work, he was in business. Tom picked out eight trashed connecting rods and cut the small ends off to represent the pre-stage and stage lights of the tree. 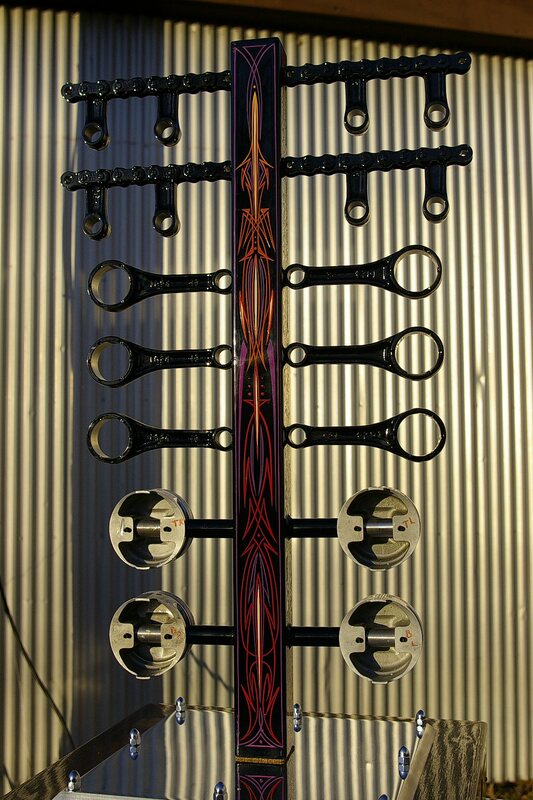 He then selected six more rods to represent the three sets of descending amber lights seen on an NHRA Christmas tree. He tried to pick six good ones for this, but one is quite bent on the large end, so when you see the tree in person, be sure to look for it. One of the toughest aspects of making the tree was the creation of the support arms for the staging lights. Tom decided to make them from worn out 630 motorcycle chain. Getting the chain oil off was difficult to say the least. Then, after cutting elements to size, he began welding up the eight-link segments. Trying to keep the motorcycle chain straight before and after welding was no easy task. To represent the launch lights at the bottom most portion of the tree, Tom wanted to use pistons with shiny aluminum tops facing out to the front. Nothing represents broken racing motors like used up pistons was his thought here. He found four look-a-like pistons and selected them from a batch out of a five gallon bucket full of junk pistons at Harry’s Machined Parts. When some steel was needed for the creation of the trophy, Tom called on his friend Randy Walker, of Walker Machine, who restores old Indian motorcycles. 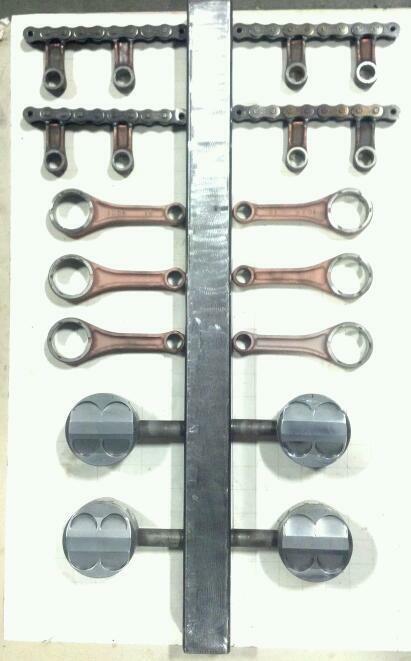 Randy was kind enough to donate some ¾” steel rod to make false wrist pins to mount the pistons. Randy also donated some steel channel to the construction of the display stand. With all components in hand, it became design and fabrication time. board and began laying pieces of scrap metal on to it to see how he could make it all look in proportion to one another and still make it resemble an NHRA starting line tree. Proper proportions and the relationships of the components dictated the design and placement of all the items. The broken and worn out drag bike components dictated the size and shape of the entire trophy. From the scraps placed in their final locations he was able to begin defining dimensions and take actual measurements to fix real locations. Once he had that, he was able to do a scale drawing on graph paper. He then envisioned all it would take to bring it all together. Size, shape, locations of parts, the color he wanted it to be and how he wanted it lettered. It took from November, 28th of 2012, till December, 15th of 2012 to do all the welding, fabrication and machining that created the tree as a metal art sculpture. Matt Graves, Jay Buxton and Jon Merrill all of A1 Parts in Brookfield MA, all helped out whenever needed. After the welding, Tom did a lot of sanding and preparation work on the bare steel to prepare the trophy tree for paint. In January of 2013, Brenden Parsons, of Parsons Auto, in Brookfield, MA became the man who painted the gloss black base on the Masters metal art sculpture. The gloss black tree was now ready for artisan, Ken Jacobs, of Brookfield, MA. Kenny’s pin striping skills are legendary; the man is a true artist. Tom brought the tree to Kenny on a custom work stand he made for the trophy mast that allowed full 360 rotation for working on it. He then explained what his vision was for the lettering and art work. At the last minute Tom decided to add the “fire” type flames to the lower portion of the trophy after seeing some of Kenny’s work on display. February was the perfect time to walk into Kenny’s shop with this, he wasn’t too busy for a change. Ten days later he was done with it. Pin Striping by Kenny Jacobs: Kenny Jacobs was given free reign to create what he thought would look best on the rear of the Masters trophy. Every line you see here was created free-hand by the master himself. Tom McCarthy photo. Kenny’s wife Sue chose the font, did some computer magic to assist with the lay out, and Kenny went to work on it with his tiny brushes and steady hands. As requested, the lettering was done in McCarthy’s favorite “variegated gold leaf.” Kenny chose all the other colors as he went along free hand striping the trophy after he first did the fire-flames. When finished, everything was clear coated. After Kenny’s work it was time to reach out for the externals of the project. Dave Lambert of F.M.T. in Freemont NH ordered up a 12” square slab of 6061-T6 ½” thick aluminum plate and at Tom’s request, Dave machined a 45 around the outer edges of the base plate for the mast. Chris Pratt and Scott Levasseur of NH delivered the plate to him at the first annual “Reaction Time Nationals” fund raiser held in February of 2013. Tom chose New England Metal Services, in Spencer MA to do the metal polishing to create a magnificent aluminum base plate finish for the trophy stand. He then took the plate to A1 Parts to do the precision layout of the hole pattern and drilled the holes by hand on a drill press at A1. Tom’s motorcycling buddy, a wood working artisan, Tim Root, of Merrimack NH, stepped up to help out with the wood working portion of the project. Tim met with Tom in November of 2012 for some brain storming ideas. Tim is a master craftsman who’s hobby it is to create from wood, various kitchen goodies that are pure works of art. It took Tim close to a month to create the massive 1” thick walnut base. The segments for the three tiers weigh in at a robust 38 pounds. The walnut hard-wood alone for this project set Tim back 250$. That’s quite a commitment for a fan of drag racing who’s not himself a drag racer. As Tim finished the wooden base to specifications, Tom launched into the welding and fabrication of the display frame. 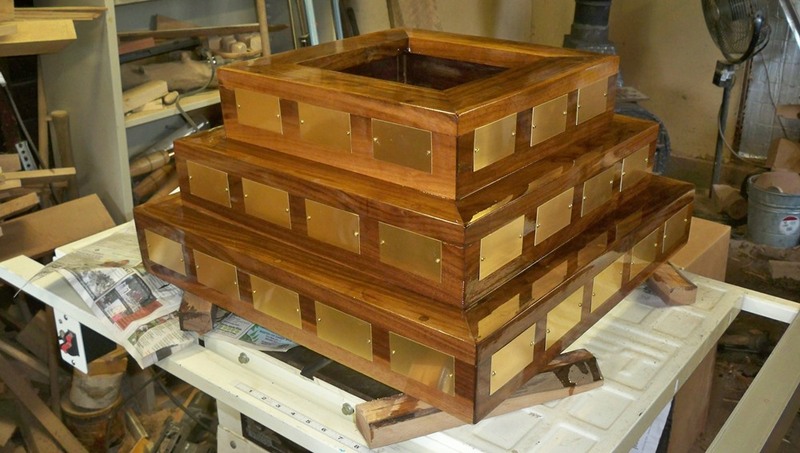 Tom designed the frame to fit as well as support the massive 60 pound trophy for ease and safety of movement. Pieces of scrap 1×1” steel tubing from an old U-Haul sign destroyed in a storm were used to create the 36” tall uprights that present the trophy at viewing height. 1+1/4” angel iron was purchased to make the capture base that holds the Masters Trophy securely in place while on display. 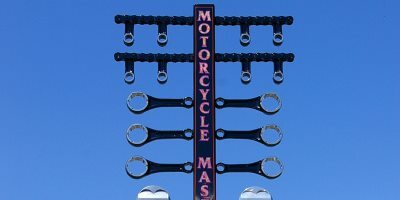 Blue Sky: The Motorcycle Masters trophy is an art work dedicated to the motorcycle drag racers at New England Dragway in Epping, NH. Each name plate will carry the name of one deserving racer each year for the next 48 years. Tom McCarthy photo. While fabricating the display stand, Tom came up with the idea for the presentation of the entire creation. He decided to wrap the whole thing in black velvet to do justice to the wood work and the Masters Trophy as a whole. MaryAnn Ciappenelli, a talented seamstress, volunteered to create the black velvet wrap with her considerable sewing skills and she gracefully put the finishing touches on the project in mid-April of 2013. From concept to creation, the Masters Trophy began as an idea in October, of 2012 and it took seven months and close to eight hundred dollars to bring, this trophy to life. Who can race for the Masters Trophy? For a racer to enter into competition to have their name engraved on this Stanley Cup rendition of motorcycle drag racing they first must be a racer who has completed a season of motorcycle competition at New England Dragway. If they were a winner or runner up in a points class, they will automatically be invited to compete in the following years Masters race. However eight slots must be filled to comprise a full ladder for the race. Any open slots not filled by a previous season champion or R/U must be filled by a racer from that season of competition, and such racers must be selected by the racers themselves as worthy of racing for the honor of The Masters. The racers vote, who they believe, are the best candidates to enter into competition. Voting is by ballot for six months from January 1st to June 1st and every Father’s Day the top vote getters, selected by the racers, will be notified when the Masters competition will commence. And they better be well prepared for that day for round one is really unkind come race day. There will be no passes made on race day prior to eliminations by any entrant in the Masters race. After tech inspections, racers report for a special photo ceremony and while they are all present, a lottery style drum type drawing is done to establish a ladder. In consecutive order, by names randomly drawn, one will race two, three versus four, etcetera until the ladder is full. In the unlikely event an unbalanced ladder should occur, the last name drawn will receive the bye-run, but must do so under full power for a full run. When the ladder is established, all racers are required to announce their dial-in number on the spot. Racers must know themselves, their track, their equipment and be a true master of their craft to go forward in this race. Each pair of racers will then engage in a coin toss to establish lane choice. Once racing begins, all NHRA and New England Dragway rules will apply except one: a full power full pass is required each round. In racing, there is chance and circumstance, adrenalin and danger. Skills are vital, but it takes more than just skills to win in the Masters race. A racer has to be good, and they have to be lucky. Most racers will tell you they’d rather be lucky than good, but luck alone can not get someone’s name engraved onto the Masters trophy for they have to win or runner up for an entire season of racing to even enter the race. Either that or be judged by their peers as worthy of competing in the competition. Every year for the next 48 seasons this very special race will happen at New England Dragway. Why did McCarthy create this race and trophy? He wanted to give back to his racing buddies and to his home track for what they gave to him over the years: something cool. There is no money to be won from this race. This is a race based on pride, honor and dignity alone: there is no price tag for that. The racers decide by deed and by voting, who will compete to be the best of the best. 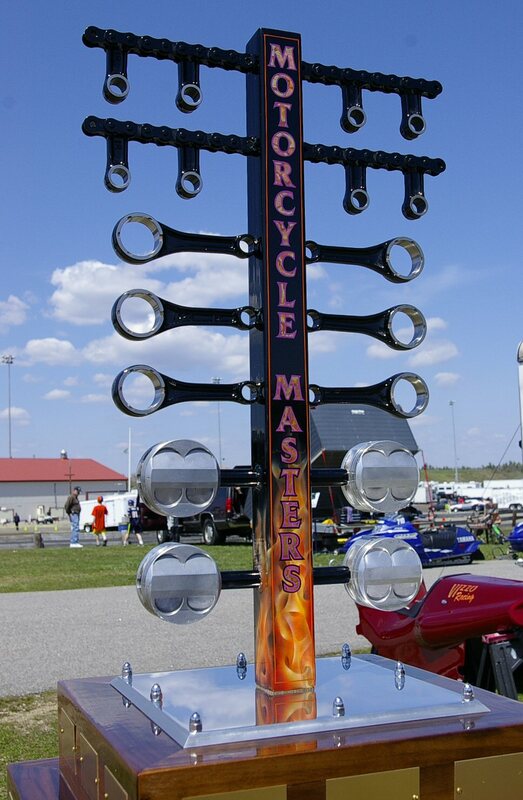 Any racer who is good enough to get their name engraved on the New England Dragway Motorcycle Masters trophy truly is a master in motorcycle drag racing. Kudos for putting this event together. I wish I could be there to enjoy the race and the festivities. Have a great time.